Please read attached e-mail from Thelma Sevilla about the sudden death of Major Urbano Quijance. For those of you that did not remember him, he attended our 23rd National Reunion in Tacoma May ,2007. 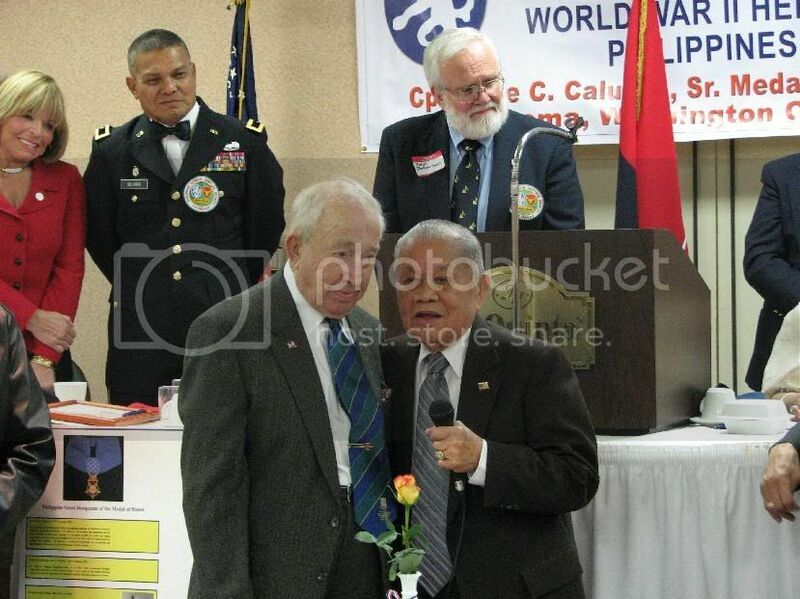 There's a picture of him and Col. John Olson who met for the first time after WWII in Bataan. Col. Olson and him served in the same PS unit during the war. Major Quijance is a PSHS life member of the Tacoma Chapter and a friend of my father. Let us pray for his family. It is with sadness that I share this news with you. I received a phone call from Norma Quijance Milluzzo this morning, Saturday, January 22, 2011. Major (Ret.) Urbano Quijance, father, grand and greatfather, community leader and WWII survivor and warrior, passed away quietly in his sleep on Saturday, January 22, 2011, between 2:00 and 6:00 a.m. He was discovered by Fannie Sumaoang in their home in Seattle. He has been transported to Bonney Watson Funeral Home (206) 322-0013. More details will be sent as they are shared by the family. Please feel free to share with friends in the Washington State Community who may know Major Quijance. My prayers and thoughts are with MAJ Quijance and his family. I would like to think he rejoins some old friends again from the regiment, and amongst the brave scouts, along with my grandfather as well. He celebrated his 95th birthday last week too.